This is an orchid garden with a twist, it has some succulents and an air plant, that give it variety. There is something going on at all levels in this garden. 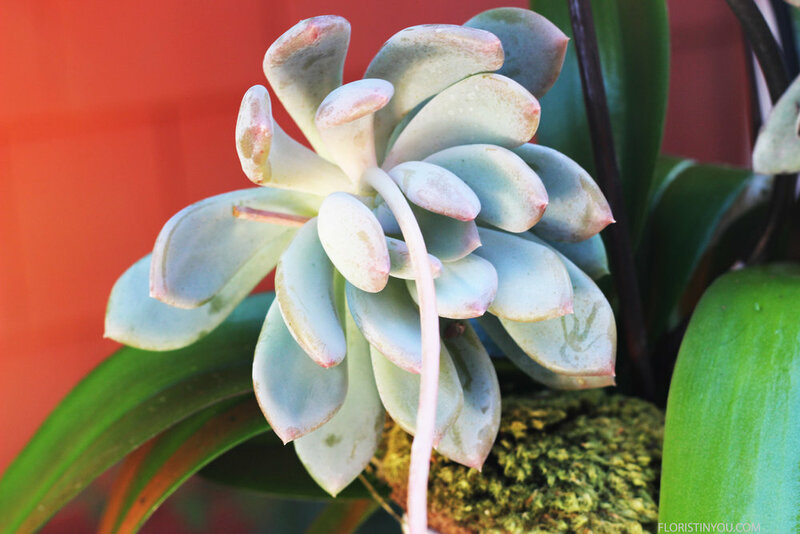 The color of the Phalaenopsis Orchids compliment each and the succulents and air plant provide different shades of green and different shapes and textures. The celery green satin wired ribbon doesn't compete in color, but finishes off the arrangement. 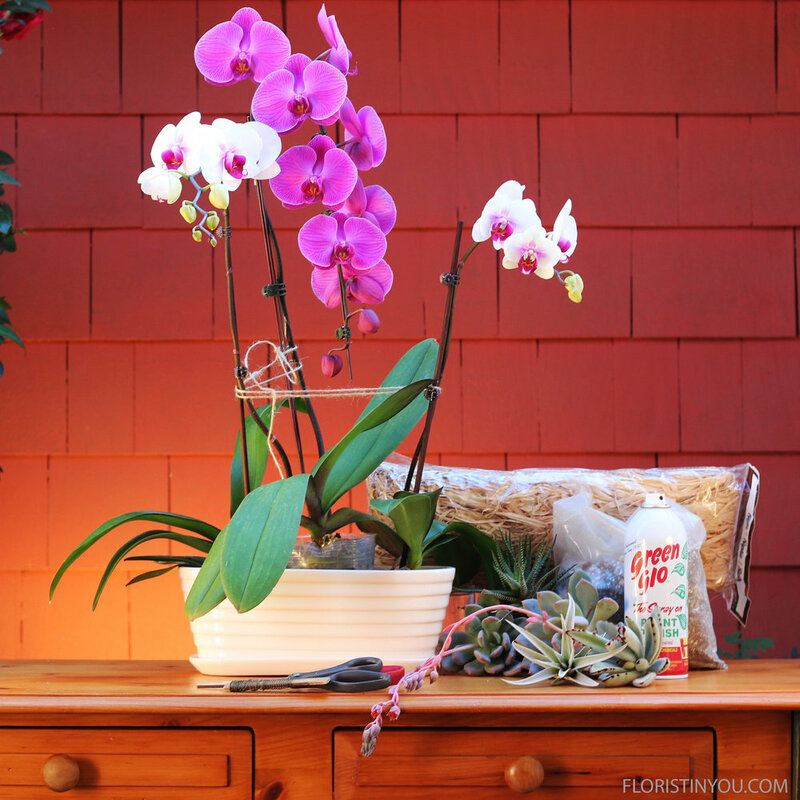 Orchids like to live in ground up bark, so they are planted in their original containers. Then the holes between the orchid cups are filled with cactus mix which provides just enough room for the succulent stems to slip into. If you take your succulents from cuttings let the ends dry out for 24 hours out of direct light before planting. The air plant is placed high up on the supporting stake for one of the Phalaenopsis Orchids. If you have your plants and supplies, let's begin. This is going to be beautiful. 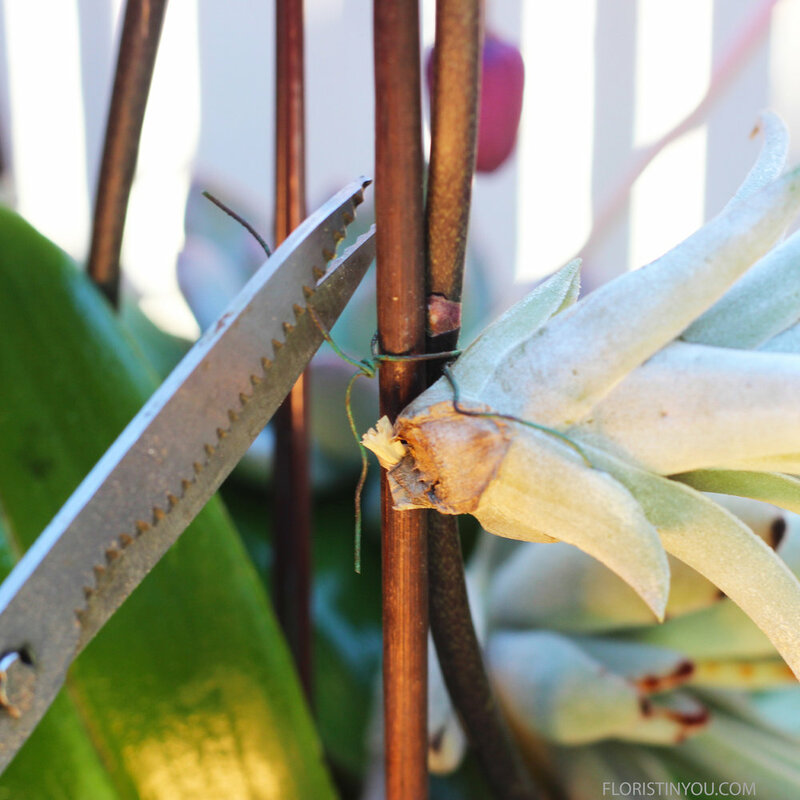 Leave stems on succulent cuttings about 9 inches long. Spray orchid leaves with Green Glow. Protect surface below. Tile end orchids out to each side a little so you have a V shape. 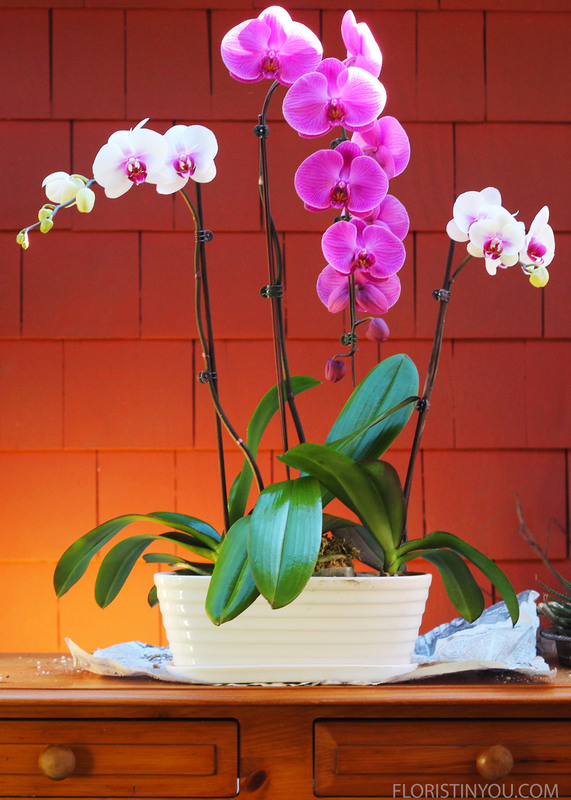 Fill spaces left around orchid cups with cactus mix. Replace orchid clips with raffia. Tie tight with 2 knots and clip close. On the left, make a hole in cactus mix with your finger. Place echeveria in hole. You can put long pick under echeveria. Wrap the wire around it. Hot glue Reindeer moss around top of pick. Plant 2nd echeveria right front with zebra plant on end. Orchid leaf supports echeveria stem. Wrap fine wire from spool around back of air plant. Twist wire with air plant around support for orchid on the left. Cut shorter with heavy duty scissors. 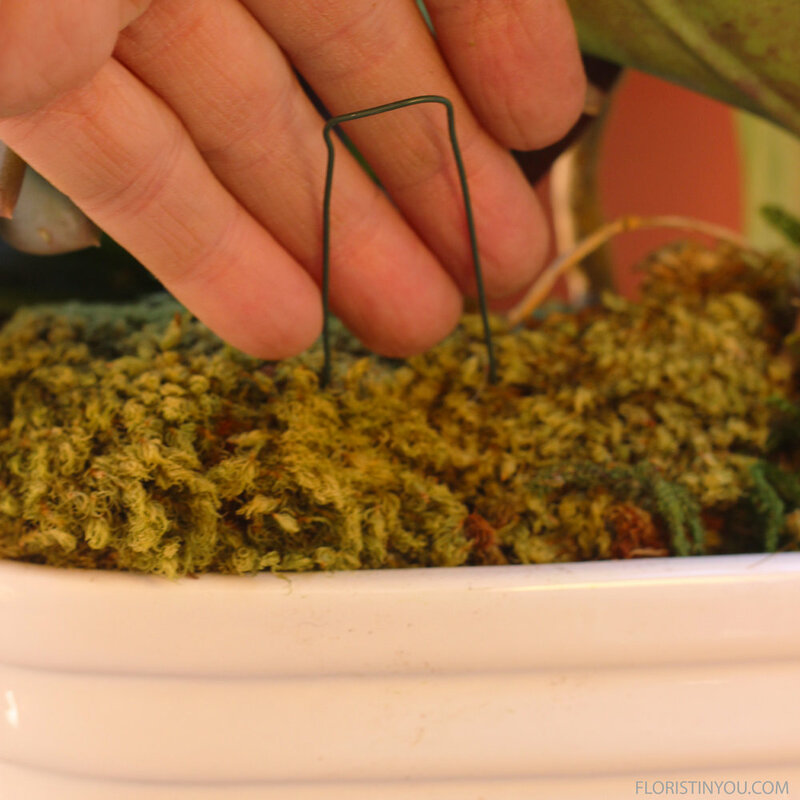 Put drop hot glue the size of half a pea on side of Reindeer Moss where it will stick to support for orchid. 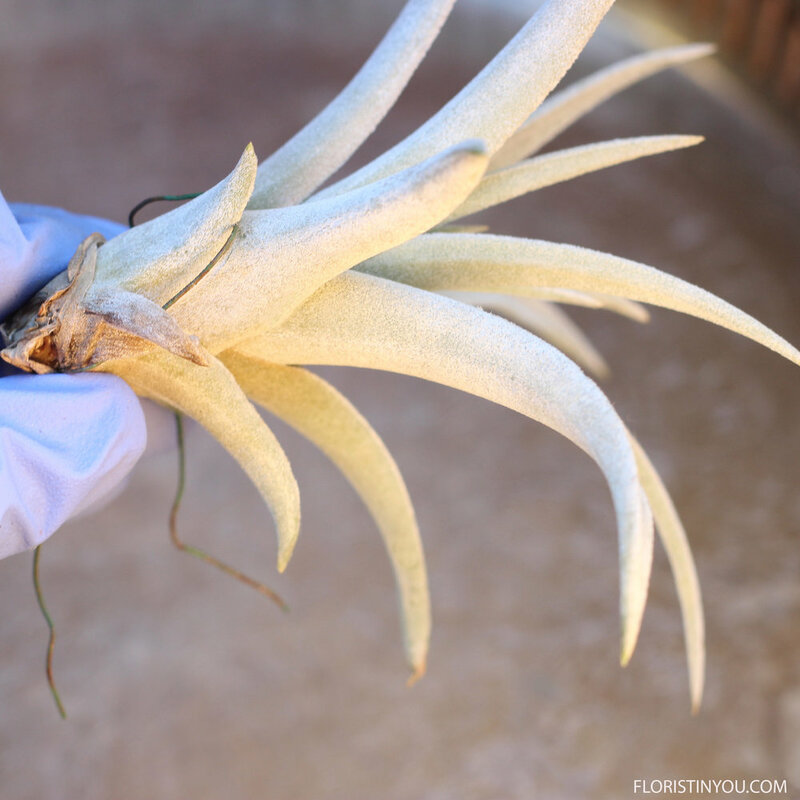 Be careful not get glue on orchid stem or air plant. Fit Mood Moss pieces (right) around base. Where it won't fit, fill in with Reindeer Moss (left). If you don't have moss pins, make some with 18 gauge wire (1 3/4 inches). 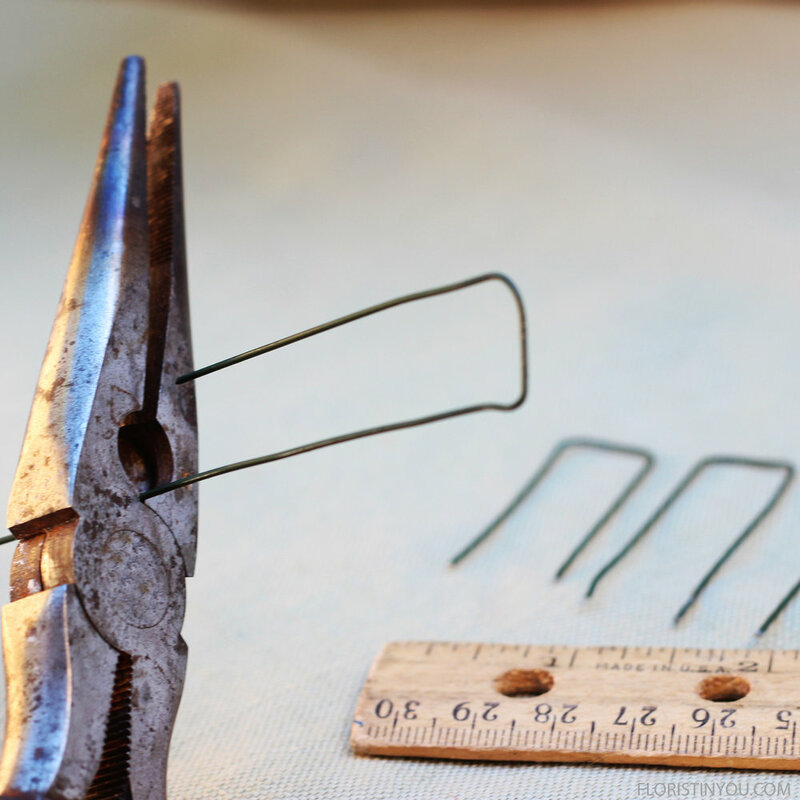 Use inside slot of needle nose pliers to cut the wire, like so. Stick pin, one leg on one side, the other on the other side of 2 pieces of Mood Moss. 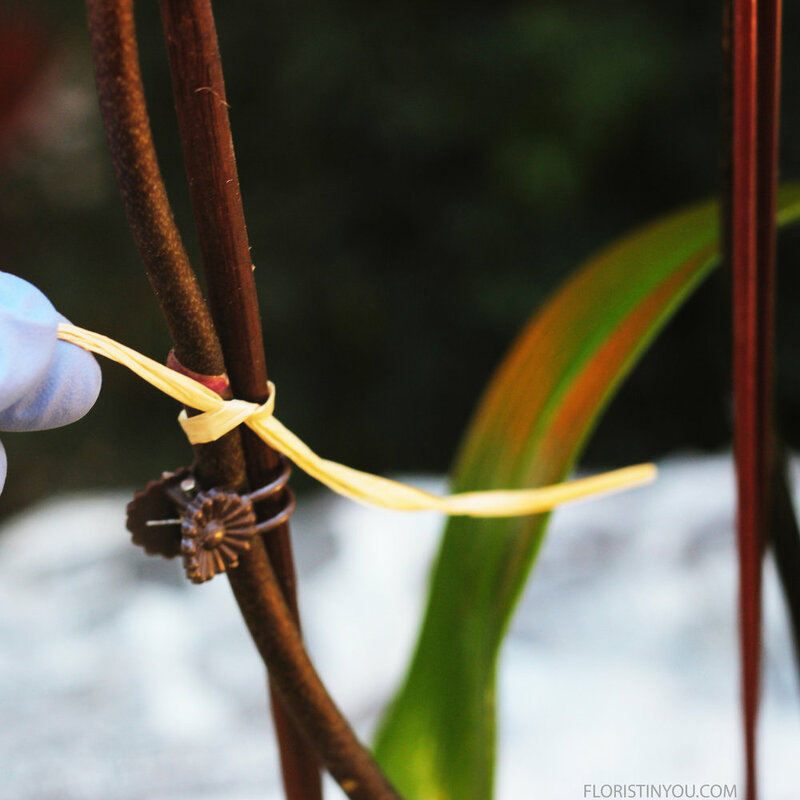 Tie ribbon on large orchid stalk. Fold ends in half. Trim with fabric scissors on 45 degree angle. and open fold. Like so. Put 1/2 pea size bead hot glue on orchid support. Catch edge of back of ribbon. Here's a close up of the zebra plant and an echeveria. Here's a close up of the echeveria. And the Panda Ear succulent. The suspended air plant looks like fireworks on the 4th of July. You are done with this orchid and succulent garden. Enjoy it.